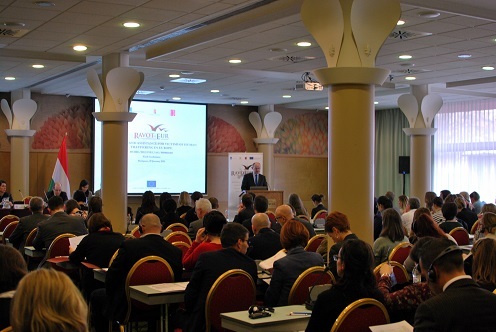 The Final Conference and Workshop of the “Referral of and assistance for victims of human trafficking in Europe,” the so called RAVOT-EUR project took place on 28-29 January 2016 in Budapest, Hungary. The event aimed to present, sum up and evaluate the project results as well as to build a better understanding of the current situation of the fight against trafficking in human beings in Europe. 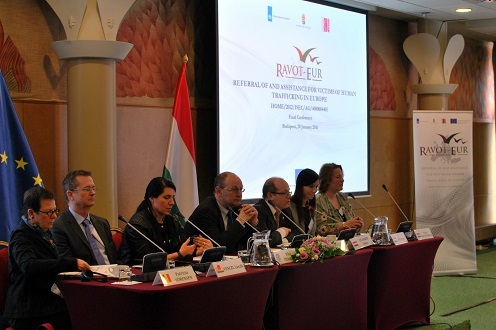 The mission of the RAVOT-EUR project was to clarify and make transparent the transnational referral system for the relevant state and non-state actors coming across victims between Hungary, the Netherlands and Belgium, to contribute to the assistance, referral and safe return of human trafficking victims as well as to facilitate transnational networking and trust building among professionals. The implementation of the project was co-funded by the Prevention of and Fight against Crime Programme of the European Union. The Final Conference and Workshop brought together more than 150 experts from 11 countries – police officers, judges, prosecutors, care coordinators, social workers, victims support officers, investigators, labour inspectors, researchers - to network and exchange their views in the field of transnational referral of human trafficking victims. The Conference was opened by Dr. Mátyás Hegyaljai, Deputy State Secretary for EU and International Relations of the Ministry of Interior. The Keynote speeches were given by Ms Irina Todorova, Regional Counter-Trafficking Specialist and Mr László Venczl, National Member for Hungary of the Eurojust. They highlighted among others that accordingly to the new trends and challenges cross-border cooperation has to be continuously widened, safe return of victims has to be developed and the coordination of joint international investigations and prosecutions has to be stimulated. The Workshops provided a great opportunity for experts for consultation on the one hand about the practical return of human trafficking victims through transnational referral mechanism and on the other hand about the organization of the safe return of a Hungarian human trafficking victim based on real cases and with the help of the website and the Information Manual. - Working together in the field of transnational referral of human trafficking victims is very new in the European Union; therefore, the extension of the cooperation should be encouraged. - For the effective transnational identification, assistance, referral and reintegration of victims it is inevitable to provide opportunity for the experts to get to know each other, trust and understand each other as well as to learn about the national referral mechanisms, processes and methods of each partner countries. - The RAVOT-EUR project provides possible solutions and ways for the assistance and referral process but each victim is different, and therefore all case has to be addressed in a tailor-made way. - Underage victims and victims who have children are especially vulnerable to human trafficking therefore they should be paid special attention and assistance.